Dominion intends to blast away, excavate, and partially remove mountaintops along 38 miles of the proposed Atlantic Coast Pipeline in Virginia and West Virginia. The magnitude of this undertaking has been described in a fact sheet, New Data: Atlantic Coast Pipeline Would Trigger Extensive Mountaintop Removal. The fact sheet was released by the Chesapeake Climate Action Network, Allegheny-Blue Ridge Alliance, Appalachian Mountain Advocates, Friends of Nelson, and the Dominion Pipeline Monitoring Coalition. One of the longest mountaintop-removal sections in Virginia is in western Highland County, where approximately 2 miles of ridgeline in the George Washington National Forest would be removed. Drainage from this area will affect two of Virginia’s remaining native brook trout streams. Brook trout require clean water and sediment-free stream beds. These trout streams, like many other streams and water supplies in the pipeline path, are at risk. 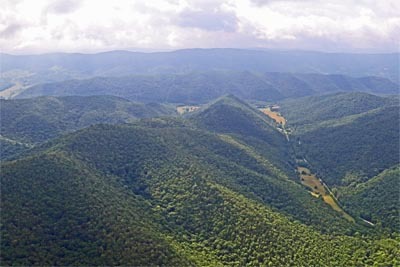 The ACP would follow and cut-down 2 miles of Big Ridge in the George Washington National Forest in western Virginia. Two native trouts streams, Townsend Draft and Erwin Draft, drain the sides of the mountain. Pipeline construction in this area will also involve multiple stream crossings and extensive excavation for access roads on steep slopes. The proposed ACP faces extreme challenges, including steep mountains, sensitive hydrology and ecosystems, and limited control technology. We have concluded that it cannot be built in compliance with regulatory requirements and without significant harm to the environment. The Dominion Pipeline Monitoring Coalition and our team of experts are prepared to review Dominion’s erosion and runoff control plans. However, the Virginia Department of Environmental Quality only recently determined that Dominion would be required to submit detailed plans for agency and public review. See: DEQ will require additional individual 401 certifications for natural gas transmission pipeline projects (April 6). To date we have not had access to erosion and sediment control plans, stormwater management plans, or steep slope stabilization plans for the part of the project that is in Virginia. Rather than sharing its plans with the public, Dominion has instead sent out its communications people to talk-up the industry’s environmental stewardship and explain how Dominion will go “above and beyond” regulatory requirements. We have studied how pipelines are constructed, and we know better. But Dominion has repeatedly indicated that the width of the construction corridor will be at least 125-feet, and in many place it will be wider, depending on the need for “additional temporary work space“. As stated above, the public has not yet had access to the actual construction plans for the ACP in Virginia; so we are still waiting to see. We have, however, seen the plans for West Virginia, and the depicted construction corridor width on ridgelines is indeed 125 feet or more.